At Paley's Place Bistro and Bar, chef Vitaly Paley brings French training and international influences to bear on his unquenchable passion for the local foodstuffs of his adopted Oregon. In The Paley's Place Cookbook, he adapts his food for the home cook, tempting the reader with a casually elegant Walla Walla Onion Tart with Fresh Goat Cheese and Summer Herb Pesto, a show-stopping Cedar Planked Salmon, an indelible Crème Brûlée, and many others. 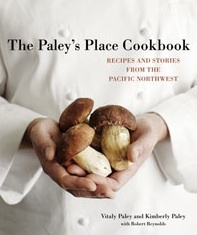 Stories of the farmers, fishers, and foragers who supply Paley's Place with ingredients and inspiration; wine notes emphasizing local wines; and photographs of the food, the restaurant, and Oregon landscapes make this book a showcase of the region's culinary riches. A [/articles/ourtable/thepaley*27splacecookbook review] and video.